I’ve got a fun St. Patrick’s Day meal! Noah, like any good Irish man, loves him some corned beef and cabbage on St. Patrick’s Day. I’ve never made it before, but it was so SUPER easy! Combine that with the fact that corned beef and cabbage were on sale last week, and you’ve got an awesome St. Patrick’s Day meal. All you do is put the corned beef/spice pack that comes with it in the crock pot, cover it with water, and let it go on high for 4 hours. Then, chop up your cabbage, add a few cups more water, and let it go on high for another 2 hours. The cabbage will look like this when you first put it in, but cooks down. …slice it against the grain really thin, and serve with horseradish…so good! Noah swears that corned beef, cabbage, and horseradish sandwiches are awesome. I guess we’ll see today. Saute the squash in a tablespoon of the butter, until soft. Meanwhile, combine the milk, sour cream, cream of mushroom soup, half of the crackers, half of the cheese, and the rest of the melted butter in a mixing bowl. Fold in squash. Put this mixture in a greased casserole dish. Top with remaining cheese and cracker crumbs. Bake for 25 minutes at 350 degrees. I was pretty proud of how it turned out…Noah loved it! On a completely different note, does anybody else do March Madness brackets? I really don’t get into basketball until this time of year. There’s something about March Madness that is SO much fun! Here’s my bracket for this year. 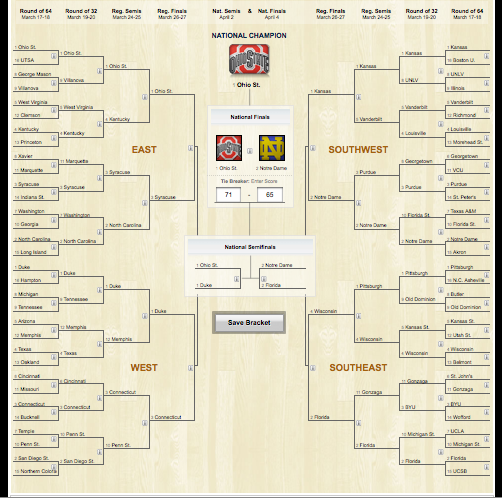 Just know I know NOTHING about how good any of these teams are…which usually means I do pretty good with my brackets! HA! Don’t forget to check out my review site for a chance to win a $100 Visa gift card from BlogHer!